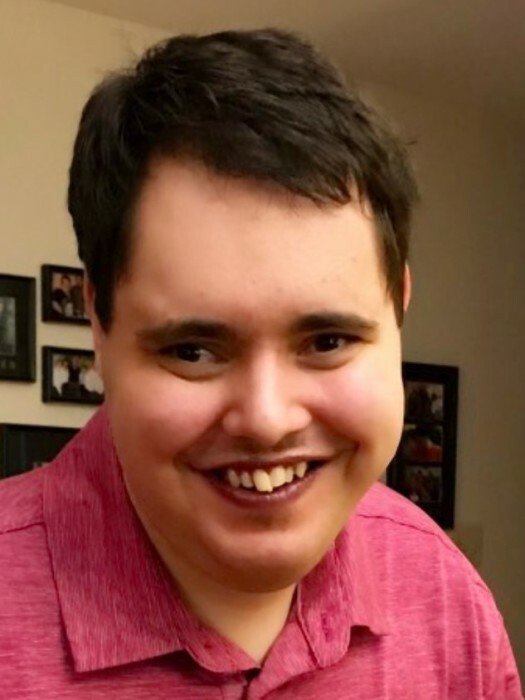 Boardman – Daniel Fazzini, 24, of Boardman, passed away peacefully Monday, morning, February 4, 2019 with his loving parents by his side. He was born August 2, 1994 in Youngstown, the son of Steve and Barbara (Kohout) Fazzini and was a lifelong area resident. Daniel attended the Rich Center for Autism and Potential Development for Autism and then was a proud graduate of the Leonard Kirtz School. Daniel will always be remembered and loved by so many for the way he touched their lives. Although Daniel never spoke a word, he spoke volumes through his smile and facial expressions. Whenever you saw Daniel, you would see him holding a cellphone case in his hand along with is one of his favorite Jibba Jabber dolls. Daniel had many passions throughout his life. He enjoyed going for rides in the car with the windows down, watching TV mostly Sesame Street, Barney, Scooby Doo and the Fast & Furious series of movies. Daniel also loved going to his grandparents, listening to music, Harley Davidson Motorcycles, and a variety of sounds and noises, especially leaf blowers, hair dryers and lawn mowers. He leaves behind to hold onto his precious memories his beloved parents Steve (Barbara) Fazzini, maternal grandparents Jerry (Sharon) Kohout of Canfield, paternal grandmother Rebecca Fazzini of Poland, his aunts and uncles Laura (Ted) Best, Lisa (Jim) Knutti, David (Sue) Kohout, Lori (Tod) Burkert and Jeff (Tracy) Kohout along with many cousins. Daniel was preceded in death by his paternal grandfather Dan Fazzini with whom he is now reunited with in Heaven. Family and friends may pay their respects on Wednesday, February 6, 2019 from 4:00 pm until 7:00 pm at the Rossi & Santucci Funeral Home, 4221 Market St., Boardman (New Location). There will be a Celebration of Daniel’s life held on Thursday, February 7, 2019 at 11:00 am at New Life Church, 2250 E. Western Reserve Rd., Poland, with Pastor Dave Allman officiating. Daniels’s family will begin greeting guests at 10:30 am. On behalf of Daniel’s family, they would like to extend their heartfelt appreciation to Home Care with Heart and the caregivers Linda Rafidi, Dorothy Paramore, Clara Santiago, and Marilyn Hutter along with Lea Marsh for all the care and compassion that was shown to Daniel over the years. In lieu of flowers material contributions may be made in Daniel’s name to The Rich Center for Autism, Capital Campaign, Fedor Hall, One University Plaza, Youngstown, Ohio, 44555. Family and friends may visit www.rossisantuccifh.com to view this obituary, sign the guestbook and send condolences to the Fazzini family.